Hayes Valley is one of our favorite neighborhoods to explore; some of our most loved eateries are here... Absinthe, Suppenkuche, Stacks, and Christopher Elbow for chocolates and hot cocoa so thick and creamy (it is pretty much liquefied chocolate). I love a good, hearty brunch, the kind where mimosas and bloody Mary's flow freely, and eggs are always fluffy and smothered with cheese. Is there any other kind? Stacks is one such hotspot serving up hefty portions of fresh, traditional brunch dishes, famous for their, what else... pancakes. 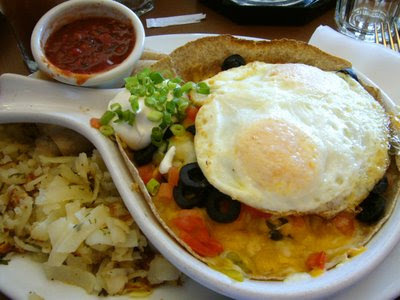 One of my brunch go-to's is huevos rancheros, and Stack's version does not disappoint. I think the thick layer of melted cheese really helps.... and I'm a big sucker for canned black olives... mmmm. 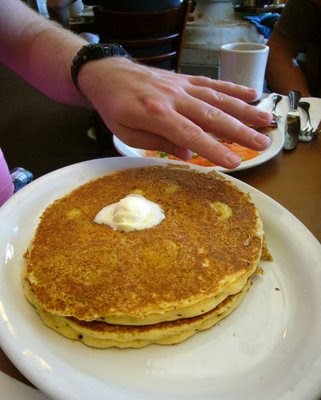 Mr. S had a short stack (2) of the pancakes with wheat germ. There's even a version with banana macadamia nut and coconut! Just to show how generous the size was, I had him put his hand next to them to compare.... They were good, light and fluffy, with specks of wheat germ for a nice texture. 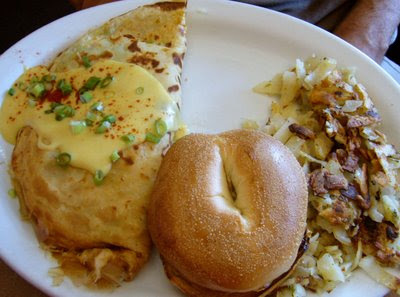 Our friends had another order of the huevos and the crab crepe, with melted Jack, avocado and hollandaise. All that food, and a whole bagel, plus hash! No pictures of this, but Mr.S also had a fresh fruit smoothie: the Jitter Bug, made super thick with espresso, vanilla yogurt, bananas, cream, and hazelnut syrup. The prices are appropriate here, and the portions are more than overwhelming. Stacks is the real deal. No messing around here. In spite of the fact that many critics comment on ed hardy clothing as nothing but tattoo pattrens, being full of unnecessary and useless things, ed hardy clothes is widely acknowledged that ed hardy shirts draws the most attention of both common young people as well as many Hollywood welcomed stars for its punk rock styles. In fact, in today’s world, many ed hardy t-shirtsdesigns are more or less the same with each othre, and ed hardy mens and ed hardy womens , absolutely, brings a totally new shock in the fashion world for its design being out of ordinary ed hardy sunglasses. How delichous they are. If i could cook ..